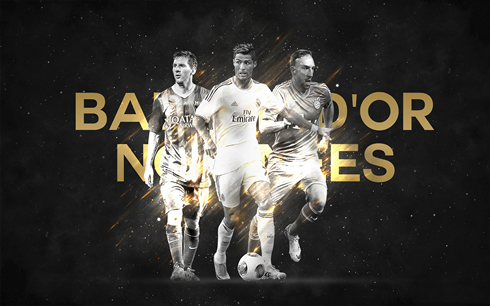 ﻿ Who will win the FIFA Ballon d'Or? Messi, Cristiano Ronaldo or Ribery? 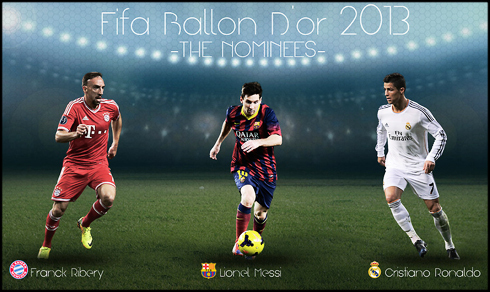 11.01.2014 » Who will win the FIFA Ballon d'Or? 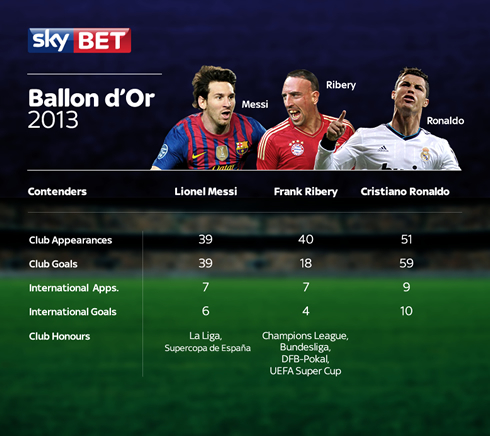 Messi, Cristiano Ronaldo or Ribery? 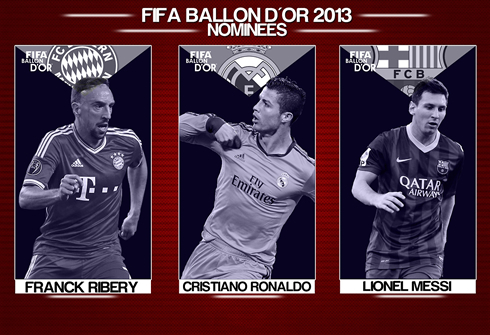 FIFA will be announcing the FIFA Ballon d'Or 2013 winner this Monday evening. Messi, Ronaldo and Ribery are the final 3 candidates to win the award, but only one will be crowned as the best football player in the World. It's the day so many of us have been waiting for. Next Monday (January 13), FIFA will host their own gala and ceremony in Zurich and the highlight of the night will be beyond any doubts the moment when the FIFA Ballon d'Or 2013 winner gets announced. After a thrilling 2013 year full of emotions and moments of sheer brilliance, it's time to finally look back at everything that happened in the past 12 months and try to figure out who has made the most to deserve winning such a prestigious and renowned award. Cristiano Ronaldo from Real Madrid, Lionel Messi from Barcelona and Franck Ribery from Bayern Munich made it to the final frontline, but as Duncan MacLeod would rightfully say on his 1986 epic movie The Highlander, «In the end, there can be only one!». The Real Madrid forward had one of his best performing seasons, finishing the 2013 calendar year with 69 goals scored in 60 games, combining his appearances at both club and national team level. From those 69 goals, he got to score 59 out 51 matches for Real Madrid, while netting 10 in 9 games for Portugal. He broke his own personal record for the most goals scored in a single calendar year , became the UEFA Champions League 2012-13 top goalscorer with 12 goals and played a decisive role in leading Portugal straight through into Brazil's 2014 FIFA World Cup. At the end of 2013, he was also the top goalscorer in La Liga and this season's UEFA Champions League, on which he set a new all-time record for the most goals scored during the group stage . His individual stats are by far the most impressive when looking at the 3 FIFA Ballon d'Or candidates and the only thing weighing against him has to due with the fact that Real Madrid didn't get their hands into any silverware during any stage of 2013. The Merengues finished 2nd in La Liga's last season, 15 points behind their arch-rivals and the current Spanish champions FC Barcelona. Real Madrid has also felt the bitter taste of losing a cup final at home, when they hosted the Copa del Rey final at the Santiago Bernabéu in May of 2013 and got defeated by Atletico Madrid by 1-2, after extra-time. Everything went wrong for the club from Chamartín, and their journey in the UEFA Champions League was no exception to that rule. Real Madrid got knocked out by Borussia Dortmund in the competition's semi-finals, after losing 4-1 in Germany and coming short in the 2nd leg played at home, with a bitter 2-0 win. Nevertheless, Ronaldo is still by far the favorite to win the FIFA Ballon d'Or and only a shocking surprise this Monday night would result in Ronaldo not adding his 2nd Ballon d'Or to his new museum in Madeira. Barcelona's living legend and the club's top goalscorer of all-time, has already won 4 straight consecutive FIFA Ballon d'Or (2009, 2010, 2011 and 2012). He has not had what we could call a bad year, but judging his numbers to his own standards, he has also had a year far from being perfect. Lionel Messi finished 2013 with 45 goals in 46 games. He had a perfect 39 goal and game record for Barcelona and scored 6 times in 7 matches for his home country Argentina. As usual, the 26-year old forward was a vital piece in Barça's season last year, but had a big setback in September in a game against Almería, when he suffered a harsh thigh injury. Those muscle problems would force him to sit out for roughly the whole last 3 months of 2013 and somehow, many still believe that it might had been enough to put him out of the FIFA Ballon d'Or race this year. Nevertheless, Messi still helped Argentina to calmly earn their ticket to Brazil's 2014 FIFA World Cup and was naturally Barcelona's flagship in their successful La Liga campaign. Barça got stopped by Real Madrid in the Copa del Rey's semi-finals (4-2 on aggregate) last February and by Bayern Munich on a painful and traumatic UEFA Champions League semi-finals, where they've ended up losing 7-0 on aggregate. Last August, Messi and his teammates would still manage to collect another piece of silverware though, after getting the better off Atletico Madrid on a 2-leg Spanish Super Cup tie. If the FIFA Ballon d'Or was a race on which club titles weighed more as a voting factor as they do now, then Franck Ribery would certainly be in the pole position to take home his first ever Ballon d'Or. That doesn't seem to be the case though and the most likely scenario is that the Frenchman will leave Zurich this Monday night with empty pockets, despite a memorable season at the helm of Bayern Munich's historic treble. Ribery scored a total of 22 goals in 47 games throughout 2013, 18 of those for Bayern Munich (in 40 appearances) and 4 for France (out of 7 matches). He has been very important in Bayern Munich's campaign last season, leading the way to win the Champions League, Bundesliga, German Cup and UEFA Super Cup, as well as helping his home nation getting the ticket for the 2014 FIFA World Cup. However, he doesn't exactly carry neither France or Bayern Munich on his shoulders, at least not as Ronaldo and Messi seem to do with the teams they represent. Bayern Munich won everything they have competed at in 2013 and even though it could be debatable that Franck Ribery was in fact the team's main figure in most of the decisive games they've had (Arjen Robben has also been quite important in several stages of the season), the Frenchman was probably the most regular high-performance player that the Bavarian team had at their disposal. Having won all titles at their reach is basically Ribery's only leverage for the FIFA Ballon d'Or gala, since his individual stats seem to be miles away from the numbers both Messi and Cristiano Ronaldo pulled off in 2013. Cristiano Ronaldo next game for Real Madrid will be against Espanyol, for La Liga (January 12, 2014). You can watch Juventus live stream, Espanyol vs Real Madrid live, Atletico Madrid vs Valencia, Newcastle vs Manchester City and Stoke vs Liverpool, all matches provided from our soccer streaming section.